I recently gave a presentation of my GroovyConsoleSpoonPlugin (see earlier posts) to the Pentaho crew, and I got a lot of great feedback on it. 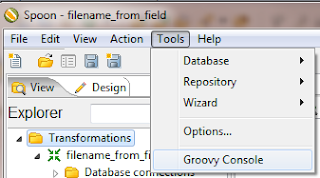 Specifically, Pentaho Architect Nick Baker suggested it would be good to have the Groovy-ized API available as a step, so we could leverage it during transformation execution. 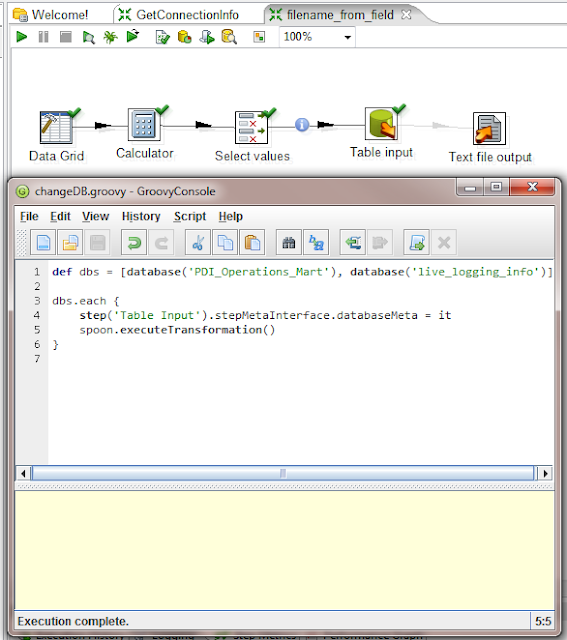 For the presentation I had made changes to the Kettle code to allow the adding of RowListeners and TransListeners, so the Groovy Console plugin could interact with a running transformation. However, his suggestion makes a lot of sense, as I can keep the plugin a proper plugin, with no changes to Kettle code needed. So to that end I added GroovySpoonScriptEngine and GroovySpoonScriptEngineFactory classes, which wrap the existing plugin code inside a JSR-223 compliant scripting engine. 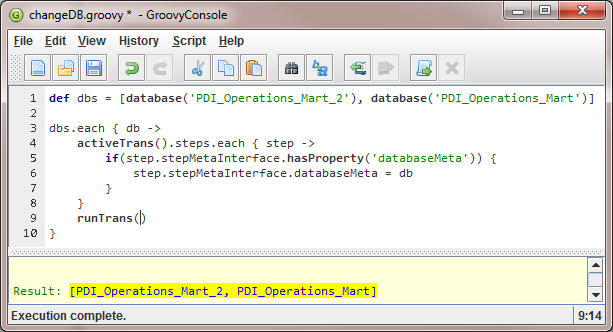 Then the Script step can execute Groovy code (with my staging code already injected) during a transformation. 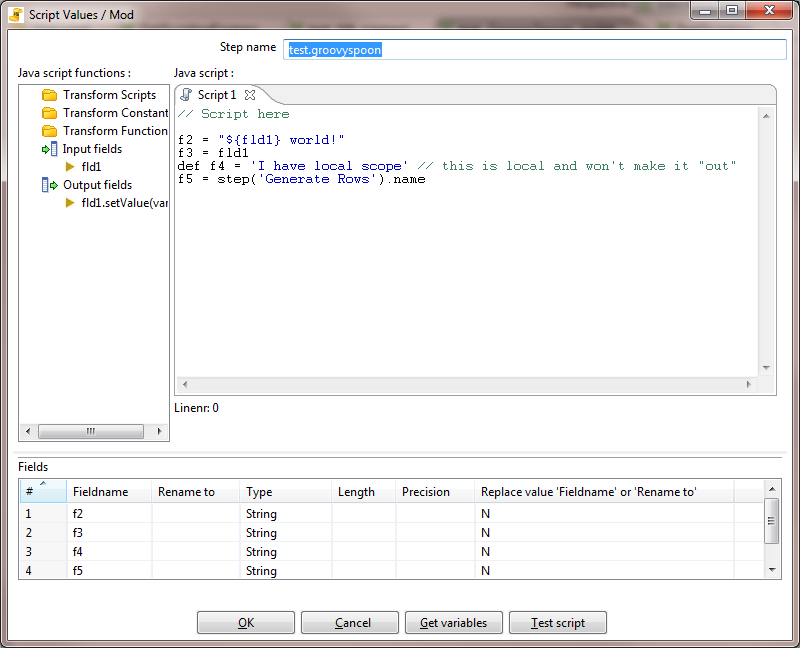 After starting Spoon, I created a transformation with a Generate Rows (for one row) with a field called "fld1" with a value of "hello". Then I wired it to a Script step, which is wired to a Dummy step. 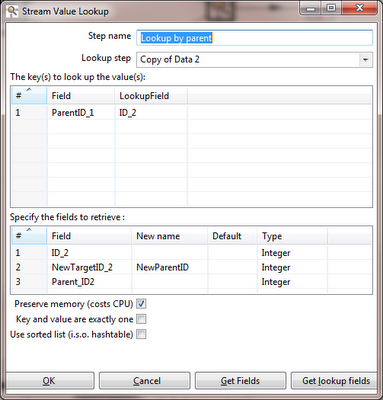 The script step does have a bit of a limitation (due to its generic nature) that the output fields must be specified in the Fields table at the bottom of the dialog. This is in contrast, for example, to the User Defined Java Class (UDJC) step, which can add values to the row on-the-fly (see previous posts). 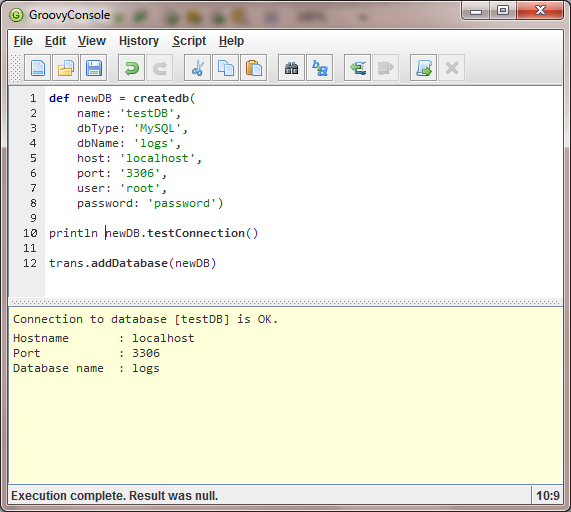 So now the plugin supports the Groovy-ized API in the Groovy Console, the command line, and the Script step. With these three entry points, hopefully interacting with PDI will become alot easier and even more powerful! The project is on GitHub under GroovyConsoleSpoonPlugin. As always, I welcome all comments, questions, and suggestions. Cheers! 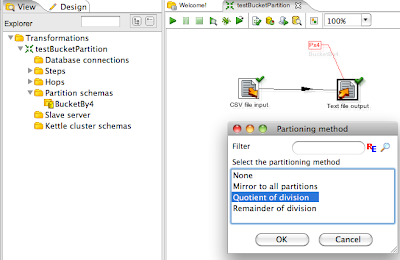 The "Verify Transformation" capability of Pentaho Data Integration (aka Kettle) is very handy for spotting issues with your transformations before running them. As a sanity check or as an auditing feature, I thought it would be nice to verify all transformations in the repository using a Kettle transformation. To do this, I wrote a User Defined Java Class (UDJC) step to call the TransMeta.checkSteps() API method, just as the Spoon GUI's "Verify transformation" button does. However, instead of displaying a dialog, I put the same information out onto the stream. NOTE: The UDJC step will accept all incoming rows (Jobs, Transformations, etc.) but will only process those whose "meta" object is of type TransMeta. If this is determined to be a useful step, I may turn it into a proper step plugin, to remove the need for the "show_successful" field, and to instead provide a dialog box to let the user choose which fields (and their names) to put out on the stream. UDJC steps are just an easy way for me to get basic functionality out there and try to get early feedback. I created a dummy repository on GitHub so I could have a Downloads area where I will start storing sample transformations that contain UDJC steps, etc. This is slightly easier than putting the UDJC code on Gist or Pastebin, especially in this case since there are multiple steps involved. The direct link to the above transformation is here. I've been working on the Groovy Console plugin for Spoon, and I seem to have been able to sidestep the PermGen issues (at least the ones I was having during my last post). Also I added some more functionality, such as the ability to get JobMeta and JobGraph information using job, jobGraph, activeJob(), and activeJobGraph(). I really wanted to have the ability to do "automated" testing from this console, so I added a runTrans() helper method. If you pass in a TransMeta object, it will run that transformation; otherwise, it will try to run the active transformation. 1) The execution settings dialog pops up if you run Spoon.executeTransformation() with no arguments. 2) If you are looping and trying to run the transformation once during each loop, the executions will step on each other as they are executed asynchronously. To fix 1, I faked a call to executeTransformation() using a replay date of the current time, which prevents the execution settings dialog from being displayed. As far as getting the settings configured, that will be a little trickier. 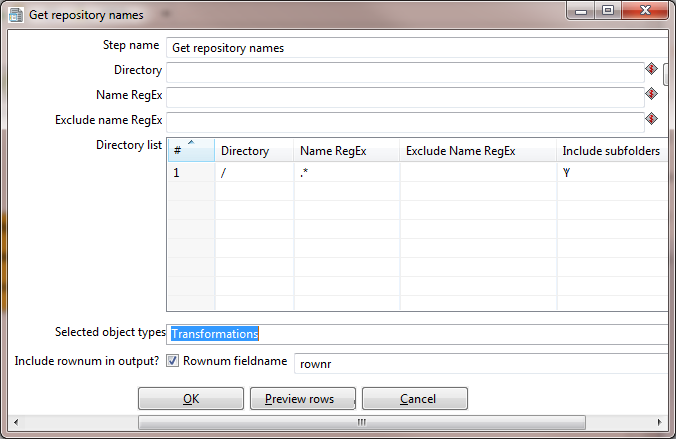 So runTrans() at the time of this writing works on transformations with no execution-specific settings, or on transformations that have already been run with execution-specific settings. This is because the transformation is effectively replayed. To fix 2, I put in a hack after the call to executeTransformation() to sleep for 10 msec while the trans is NOT running, then to sleep for 100 msec while the trans IS running. This is a classic no-no for concurrency but it's in there to get things working in the happy-path case. This turns runTrans() into a synchronous call, which is fine for my purposes in the console. One thing to note is that I'm changing the step metadata using "back-door" API calls, so the transformation graph is not marked as "dirty". If for some reason you need to save the changes you should be able to call some form of Spoon.save API method. The updated code and downloads are on GitHub. Have fun! Some Groovy support already exists in the form of the Script step in the Experimental category. This step allows any language that supports JSR-223 to be used in scripting a PDI step. Also I believe there is some Groovy support in the Data Mining product in the Pentaho suite. - spoon: this variable is bound to Spoon.getInstance(), and thus offers the full Spoon API such as executeTransformation(), getActiveDatabases(), etc. - pluginRegistry: this variable is bound to PluginRegistry.getInstance(), and offers the Plugin Registry API, such as findPluginWithName(), etc. - kettleVFS: this variable is bound to KettleVFS.getInstance(), and offers such methods as getTextFileContent(), etc. - activeTrans: This method calls Spoon.getInstance().getActiveTransformation(), and is thus more up-to-date than using the "trans" variable. - activeTransGraph: This method calls Spoon.getInstance().getActiveTransGraph(), and is thus more up-to-date than using the "transGraph" variable. - step(String stepName): This method returns the StepMeta object for the step in the active transformation with the specified name. Right now I'm having PermGen memory issues when running transformations, so until I get that figured out the console is probably best used for looking at and editing metadata rather than executing "power methods" like executeTransformation(). 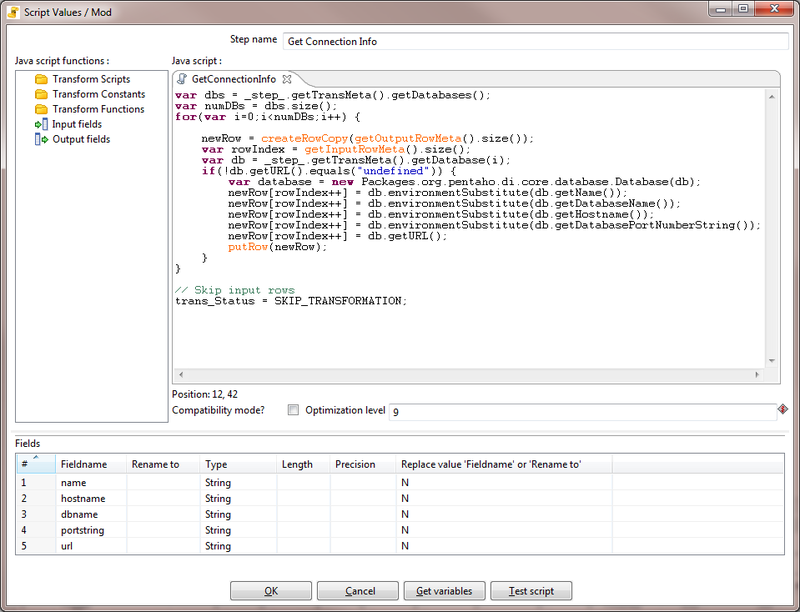 Using the API, you should also be able to create new steps, transformations, etc. I'd be interested to hear any uses you come up with, so please comment here if and how you've used this plugin. The code and downloads are up on GitHub, just unzip the folder into plugins/spoon. Cheers! UPDATE: It appears that in PDI 4.3.0 there is an older version of the Groovy JAR in libext/reporting, which causes the console plugin not to work. You can try replacing that JAR with the one included in the plugin, but I'm not sure if the reporting stuff will continue to work. In the upcoming release, the version of the Groovy JAR has been updated to 1.8.0. Lately I've been fooling around with the various PDI/Kettle plugin types while reading Matt Casters et al. book "Pentaho Kettle Solutions", and I reached the section on partitioners, which intrigued me. 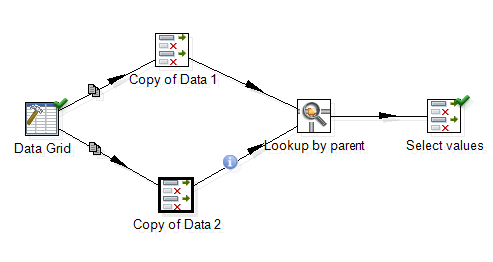 Around the same time, someone had asked a StackOverflow and/or Pentaho Forums question on how to get at certain data from a "flat" XML file, meaning the data he was interested in was not contained in a parent tag, rather it was a certain number of fields AFTER a particular tag. The solution I proposed was to use the row number to create a sort of "bucket", where the first N rows would be in the first bucket, the next N in the second bucket, and so on. Then it occurred to me that this is just a different form of the Mod Partitioner, except you use the quotient of the division (over the number of partitions) rather than the remainder. This seemed like an easy thing to implement since all the infrastructure code was already done by the ModPartitioner classes. So I copied the source files into a new project, using a @PartitionerPlugin annotation on my BucketPartitioner class (the ModPartitioner, being part of Kettle core, has its plugin attributes located in the kettle-partition-plugins.xml file). I got the results I desired for a partition size of 4, with the first 4 rows (starting with row number 0, so the first "group" only had 3 rows in the bucket versus the usual 4) in file-A.txt, the second 4 rows in file-B.txt, etc. I left the (% nrPartitions) expression in (as suggested by the authors) so that row 16 would be in bucket A and so on. As always, I welcome all comments, questions, and suggestions :) Cheers! I got some pretty good feedback about my previous UDJC step that creates a Data Grid model of a Kettle stream, but I noticed right away that the process for using it is a bit long. You have to paste in the step, wire it into the trans, run the trans, remove the steps before the UDJC, then wire the Data Grid in place of the UDJC, delete the UDJC, and save the trans with a different name. 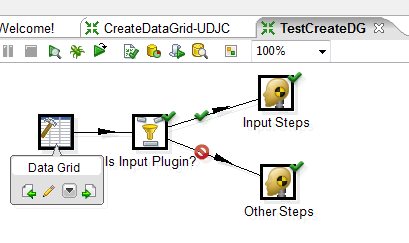 The Kettle API provides all of the above operations, so I thought I should upgrade the step to create a new transformation with the Data Grid step as the source, connected to the rest of the transformation (after the UDJC step). Along the way I also found some issues with threading and metadata in the previous UDJC step, so I fixed them in the new one. One thing to remember is that the step the Data Grid is wired to might have referenced the previous step(s). Because the metadata is different for each step, I couldn't interrogate the step to see if it referenced previous steps, and thus I couldn't change the setting. This means if the step after the Data Grid references previous steps (like Merge Rows for example), you will have to edit it to reference the Data Grid instead. Anyway, I hope this helps! If you try it out, please let me know how/if it works, if it's useful, and if you'd like to see any other features. Cheers! Sometimes when folks write Jira cases against PDI, they post sample transformations that reproduce the problem, which can be very helpful. However, often the transformation references a database that PDI developers can't access, which renders the transformation not-so-helpful for debugging and reproduction purposes. We usually ask that the case writer create a Data Grid step or something that will recreate the offending data without requiring a database connection. This can get complex and may be beyond the skills of some users. To that end, I wrote a User Defined Java Class (UDJC) that will read in rows from a step and create a Data Grid step in the transformation that contains the meta and data necessary to recreate the problem. 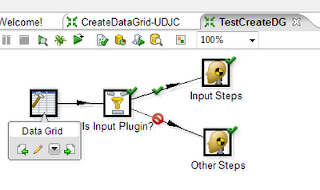 The user can paste the UDJC step into their transformation, insert it after the step they wish to model, then run the transformation. 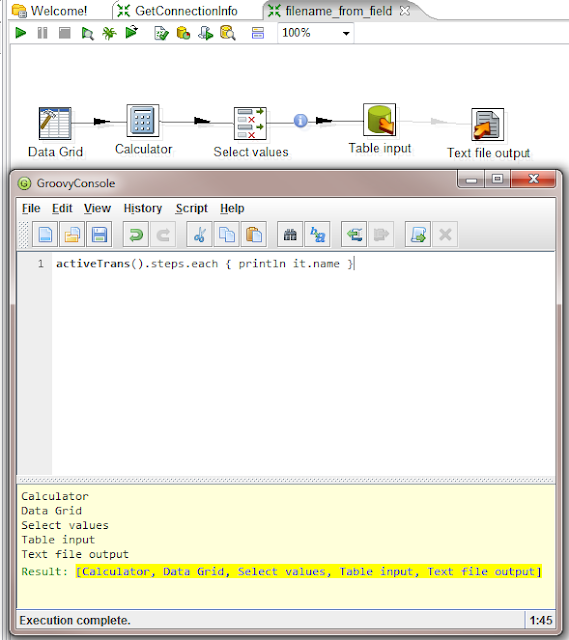 At the end, a Data Grid step will be added to the transformation, and the user can substitute it into the transformation in place of the step as a row provider. 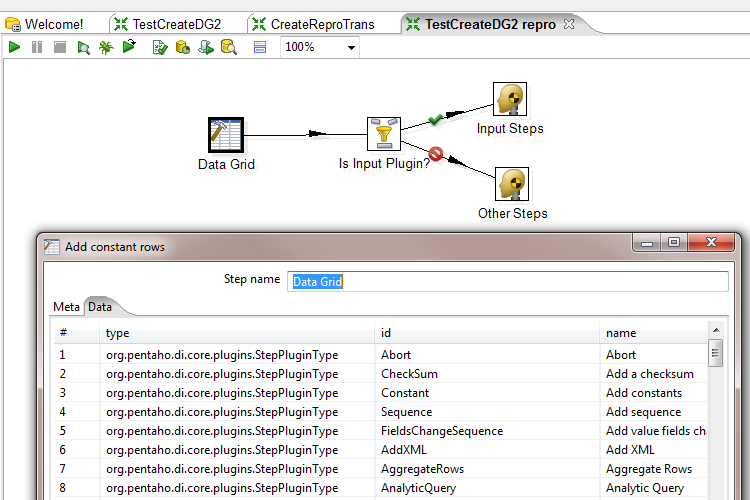 Previewing the Input Steps step, I get the same results as I did with the Get Step Plugins source! 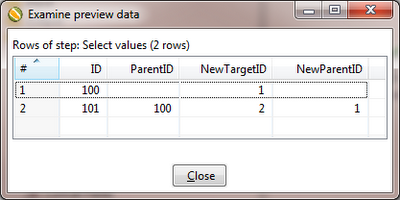 I added Undo support so you can use Ctrl-Z to undo the addition of the Data Grid step if you wish. The code for the UDJC is located on Gist here. I've already got ideas on how to make the "creating a reproduction transformation" process even easier, but I think this is a decent first step towards that. Let me know what you think! Most times I see examples (including my own) of the User Defined Java Class (UDJC) PDI step, I see a Generate Rows step in front of it, to act as a "trigger" to get things moving, as UDJC is a Scripting step, not a proper Input step. However, this is not a forced characteristic, meaning you can write a UDJC step that acts as an Input generator step! I like the Step Information dialog in the Help menu of Spoon, it lists all the information about the loaded step plugins. It occurred to me that it might be nice to know this info while running a job or transformation, and while looking through the code, it turned out to be pretty easy. This code can easily be adapted to fetch all plugins, or even to specify the type(s) on the incoming stream. I have a source table (from a MS DB) that contains a field "ParentID", which references the PK of "ID"
The target Postgres table is filled (new "ID" PK inserted from sequence) and the "ParentID" is set to null. The stream has a the new PK inserted within it. 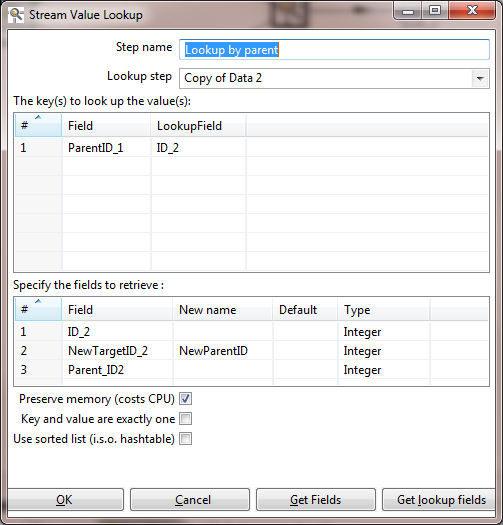 How do i do a "Stream Lookup" (or maybe something else) and lookup the values to create a new stream field to give me a new field of "NewParentID"
I'll try to get this example transformation up on Box or our Wiki. As far as I can tell, the current Google Docs plugin for PDI works on Spreadsheets and perhaps other Google Docs data sources, but not Fusion Tables (which at the time of this writing are currently in beta). I whipped up a quick User-Defined Java Class (UDJC) step, the code is on Gist here. I didn't use the OAuth method of access, the username and password (along with table id) should be passed as input fields to the UDJC step. The table id is available in the URL when you open the table in Google Docs. You need the Google Docs plugin installed in PDI for this step to work. While reading "Pentaho Kettle Solutions" Chapter 20 ("Handling Complex Data Formats"), Matt Casters et al pointed out that some data is semi-structured or unstructured, and that the rules for defining the structure "may be very complex and hard to formulate". They go on to offer regular expressions as a solution, but note that some regular expressions (such as the one for RFC 2822 email addresses) are "quite convoluted". Fortunately there are better ways to define grammars for complicated data formats, and my favorite way is ANTLR. Grammars are specified in a BNF-like format, and ANTLR will generate Java source code for the lexer and parser(s). 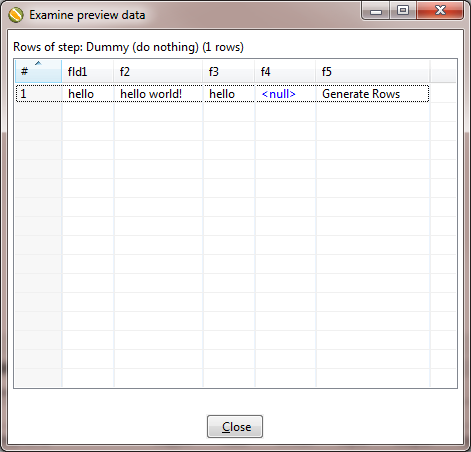 There is also a slick IDE for ANTLR grammars called ANTLRWorks, both tools are released under the BSD license. Originally I wanted to use Janino to compile the Java source, but this posed two problems related to how ANTLR generates Java source. 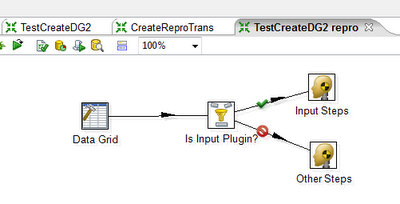 First, ANTLR inserts @SuppressWarnings annotations, which are not supported by Janino. I had code to remove these lines, but then I ran into a Janino bug that prevents the compilation of ANTLR-generated Java source files. For this reason I switched to javac for compilation. However, this requires that you have the JDK installed and the javac command in your path. Here I have chosen to validate CSV files by using the grammar here, providing the content on the stream, the entry rule name, and the result fieldname. Currently the result field will contain a 'Y' or 'N' character whether the content was valid or not, respectively. 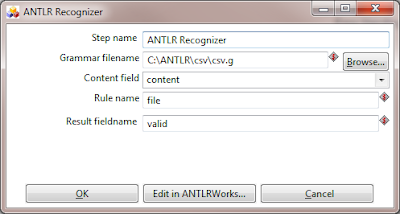 The AntlrParseException class is provided with the ANTLRRecognizer.jar in the plugin folder. 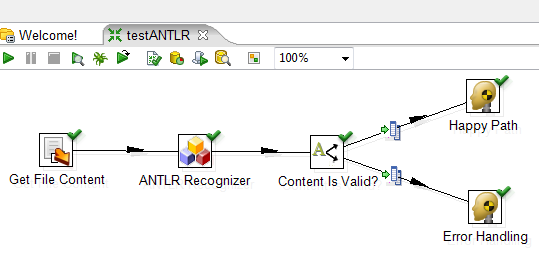 This exception will be caught by the ANTLR Recognizer step and the result field will contain a 'N'. The Java source and class files are only generated when the grammar file has been modified since the last time the source and bytecode were generated. See the Future Work section for planned enhancements. Many line-based grammars have a rule to parse a line and a rule that parses every line in the input. Using the Rule name field, the ANTLR Recognizer step can either validate the whole input (if you are loading content from a file, for example), or line-by-line (if the lines are rows on the stream). If the grammar has both rules, it does not need to be regenerated to use either rule. Having a validator is all well and good, but if you need to get at specific data in complex structures, you still need regular expressions with grouping or some complicated solution. I'm planning on specifying parser patterns and/or providing helper classes such that the ANTLR Recognizer can put recognized rules out on the stream. This would work similarly to the XPath functionality in XML steps, although any hierarchy would have to be baked into the grammar, as a rule matcher doesn't necessarily know what parent rule it is a part of. I may suggest or insist that this is the case, in order for a future version of the step to be more flexible. If/When Janino 2.6.2 is released, I will try to switch to Janino in order to remove the JDK dependency. It should be allowed to select a grammar that has already been compiled, rather than the grammar definition from a file. The step could search the usual PDI directories looking for JARs that contain classes that extend the ANTLR lexer and parser classes. The user should be able to select either a filename of an ANTLR grammar file (*.g) or from a dropdown of recognized grammars, and possibly even from a filename pointing at a grammar JAR that is not in the searched PDI directories. 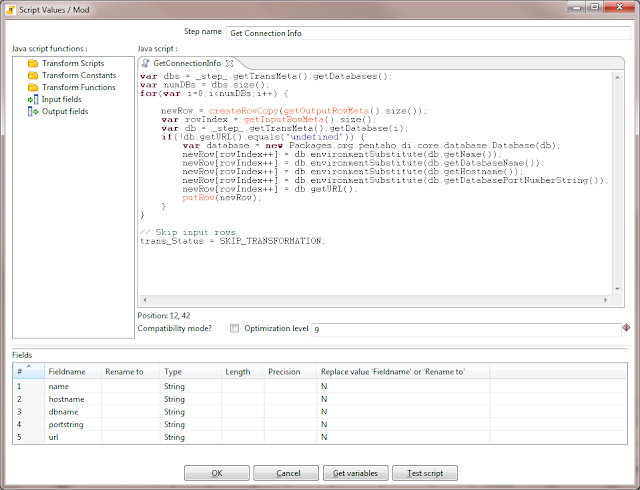 The project, including source and the plugin package (ready to drop into your PDI instance) are located on GitHub here. The code is on PasteBin here. NOTE: Make sure the Compatibility mode checkbox is not checked (see above image). This can be extended to fetch other information such as username, tablespace, etc. 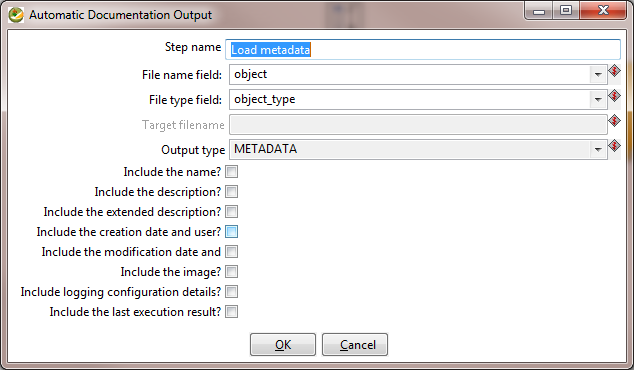 Alternatively, you can hop to Roland's transformation to grab all JDBC metadata. 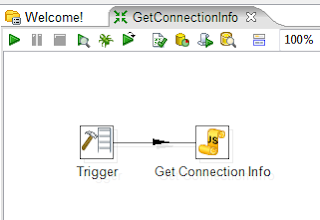 Hi there, I'm Matt Burgess, a Senior Java Developer for Pentaho Corporation. 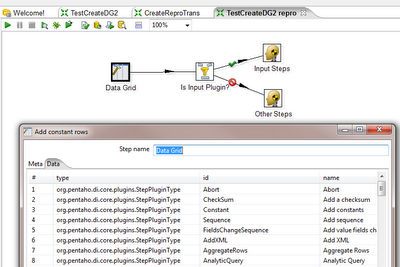 I mainly work on the Pentaho Data Integration (PDI) product, also known by its community name Kettle. Sometimes I have a few side projects, pro tips, and cool features to showcase, so I created this blog to share my ideas, examples, etc. I welcome all feedback, suggestions, improvements, etc. so don't be shy :) Enjoy!